This bit of A.M. Awesome will bring back fond memories for those of you who grew up playing the wonderful LucasArts adventure games like Maniac Mansion or Indiana Jones and the Fate of Atlantis. At the time these games were top notch graphics pieces but now the art is delightfully retro, and artists like Mads Herman use that to their advantage. 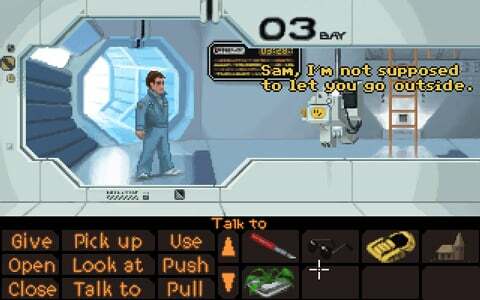 The Danish graphic artist used the LucasArts SCUMM guidelines to create his latest piece, which turns Duncan Jones’ Moon into a LucasArts style adventure game. You can plainly see the style influence as long as you’re familiar with the genre. The action choices, the item list, and the art style are all indicative of those classic games many of us loved as kids. Herman also has some seriously awesome artwork on his website that I suggest checking out, but you can scope out the super rad SCUMM Moon artwork below and be woefully disappointed when you realize it’s just an image and you can’t actually use the plant on anything.